Persistence Market Research presents a comprehensive and detailed review of the global industrial dryer market in a new publication titled “Industrial Dryer Market: Global Industry Analysis and Forecast, 2016 – 2024”. The report delves deep into different markets spread across geographical locations to fetch out crucial and relevant information about the global industrial dryer market. The report was crafted by collating data related to the regional markets, product type and end use. This report is a testimony of the upcoming market shifts that are going to redefine the market size and the market value. The report has registered all important information likely to play a crucial role in changing the fabric of the global industrial dryer market. The report depicts all major tends, drivers and restraints that will affect the ecosystem of the global industrial dryer market. Through detailed calculations the Persistence Market Research team has depicted the smallest possible details of the global industrial dryer market in this comprehensive market insight. The report showcases the true psyche of the market and also talks about the expansion, mergers and acquisitions that will probably impact the vendor demography in the days to come. The report on the global industrial dryer market starts with an executive summary followed by research methodology and market overview. The executive summary provides a bird’s eye view of the global industrial dryer market. The market taxonomy is another crucial segment which is clubbed in this report and it gives a dissected view of the entire market on the basis of region, product type and end use. The report has registered all the drivers, restraints and trends under market dynamics. In the forecast section the report talks about the evolving market climate that might impact the market share by product type, market share by end use and market share by region. This section of the report projects the potential of the overall market based on both value and volume. The succeeding section of the report divides the entire global industrial dryer market and projects the individual growth potential of each region in terms of value and volume. The report puts forth the profiles of few of the leading market players and presents a detailed abstract of their overall business performance and a comprehensive evaluation of their short-term and long-term business and go-to-market strategies. This section is intended to provide report audiences with a dashboard view of the competitive landscape of the global industrial dryer market. Persistence Market Research leverages secondary research extensively to ascertain the overall size of the global industrial dryer market and top industry players. In addition, the experienced team of analysts has gathered relevant market insights and data by speaking to various manufacturers operating in the global industrial dryer market. This massive amount of data gathered through primary and secondary research is validated using different methods such as the triangulation method and is further scrutinized using advanced tools to glean pertinent qualitative and quantitative insights into the global industrial dryer market. This report on the global industrial dryer market encapsulates the key metrics that accurately describe the global industrial dryer market and uses this data to compare market performance across the various segments and regions. The report gauges the Compound Annual Growth Rate (CAGR) for the global and regional markets and analyzes the global industrial dryer market on the basis of growth parameters such as Year-on-Year (Y-o-Y) growth to understand market predictability and to identify the right opportunities likely to emerge in the global industrial dryer market in the forthcoming years. Further, different market segments have been studied by conducting a Basis Point Share (BPS) analysis to understand the relative contribution of individual segments to overall market growth. This detailed level of information is important to identify the many key trends governing the global industrial dryer market. Another notable feature of this report is a projection of the revenue forecast of the global industrial dryer market in terms of absolute dollar opportunity. While this is usually overlooked when forecasting the market, absolute dollar opportunity analysis is critical in assessing the level of opportunity that market providers can look to achieve and also to identify potential resources in the global industrial dryer market. The report further dissects the different market segments in terms of their growth and performance in the global industrial dryer market and provides a market attractiveness index to help market players identify current and future market opportunities. The report on the global industrial dryer market focuses on the consumption of primary industrial dryers across the globe. The report considers the Weighted Average Selling Price (ASP) of industrial dryers globally. Top-down approach has been used to assess market numbers for each product category. Bottom-up approach has been used to counter validate the market estimations. Macro-economic indicators such as GDP and industrial production index have been considered while forecasting market numbers. Drying is an integral part of the process industry. Drying is used in the manufacturing of products. There are several industrial dryers available in the global market and they are vividly used in multiple industries. Flash dryer and Vacuum dryer are at a slow growing stage in the product lifecycle owing to limited use in the industry. On the other hand, Rotary dryers which find application in construction materials, minerals, chemical industries etc. have reached a maturity stage whereas Fluidized bed dryer and Spray dryer are at a growing stage of the product lifecycle. The average replacement rate of industrial dryers per year is expected to be around 7% to 9%. The global industrial dryer market was estimated to be valued at more than US$ 2,500 Mn by 2016 end and is expected to touch nearly US$ 3,415 Mn by the end of 2024, expanding at a CAGR of 3.5% over the forecast period. The global industrial dryer market is projected to represent incremental opportunity of more than US$ 830 Mn between 2016 and 2024. Increased demand for industrial dryers from the food and chemicals industry in North America is expected to propel the demand for industrial dryers in future. The market for industrial dryers in this region was likely to be valued in excess of US$ 700 Mn by the end of 2016 and is expected to increase at a CAGR of 3.9% within the assessment period. This regional market is expected to stay below US$ 1,050 Mn until the end of the forecast period. The APAC industrial dryer market is anticipated give a steady competition to the North America industrial dryer market during the forecast period. The market in APAC is projected to gain 100 BPS by 2024 due to increasing demand of industrial dryers in the food, chemical, and fertilizers industries. APAC is expected to witness significant growth throughout the forecast period. China will lead the APAC industrial dryer market. In terms of volume, the country is anticipated to witness a staggering growth within the forecast period. The demand for industrial dryers will soar in China as these tools will be massively procured by the food processing plants spread across China in the coming few years. China will bolster the growth of the APAC industrial dryer market and APAC is expected to represent an incremental dollar opportunity of more than US$ 300 Mn between 2016 and 2024. 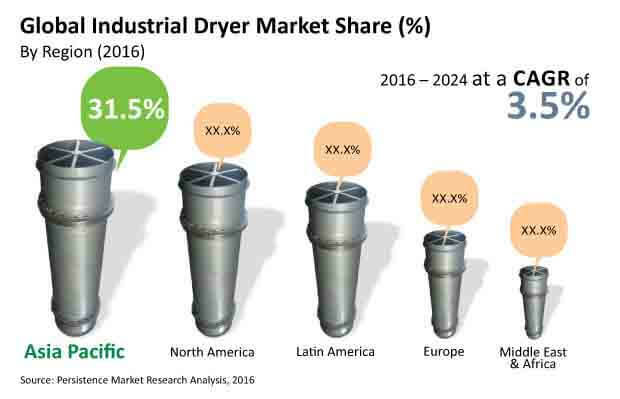 The region is expected to account for more than 30% share of the global industrial dryer market. APAC is expected to increase its market value share and go beyond US$ 1,100 Mn by the end of 2024. The APAC industrial dryer market is anticipated to incline towards high value – high growth during the forecast period. In terms of volume, the industrial dryer market in APAC is estimated to reach 1148 units by the end of 2024, exhibiting a CAGR of 3.1% in terms of volume over the forecast period. Mushrooming chemical manufacturing plants in this region is anticipated to upsurge the demand for industrial dryers during the forecast period. Moreover, increasing adoption of industrial dryers in food processing plants and fertilizer industries in APAC is further expected to drive the growth of the industrial dryer market in this region. Changzhou Fanqun Drying Equipment Co. Ltd.
YAMATO SANKO MFG. CO. LTD.